August 5, 2010 - no comments. Posted by Larz in My Dads Record Collection. 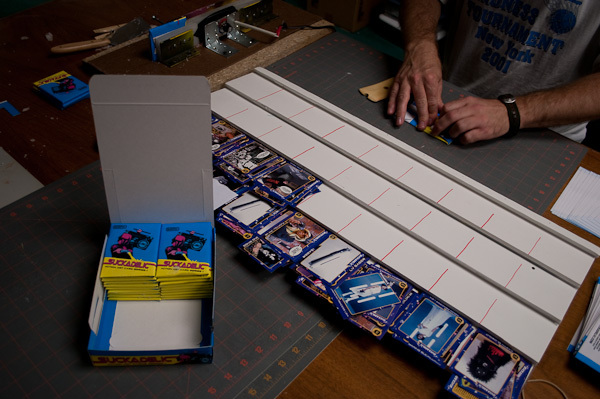 This is the packaging I made up for single pack sales via Art-O-Mat machines. They asked for one sample, but I made up three to send them. 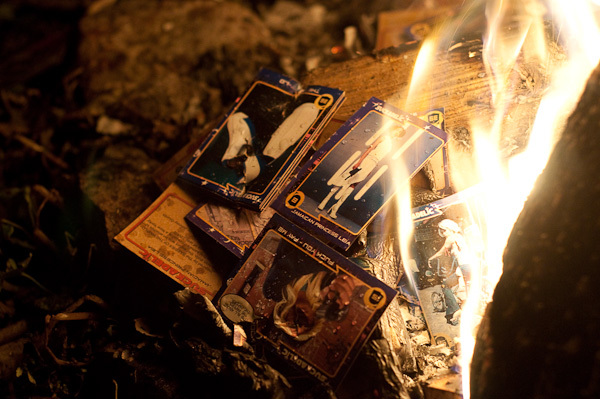 Dimensions are slightly smaller than standard trading cards, since they have to fit into a 2-1/8″ by 3-1/4″ by 7/8″ package. 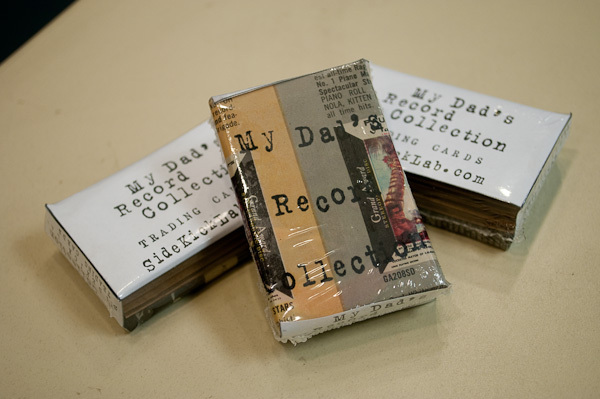 Still made like the regular cards, with wax paper wrapping, but more like the original tabacco trading cards. I’ll send them with the paper work to Art-O-Mat tomorrow. Got my fingers crossed. July 30, 2010 - no comments. Posted by Larz in The Art Hustle 1. 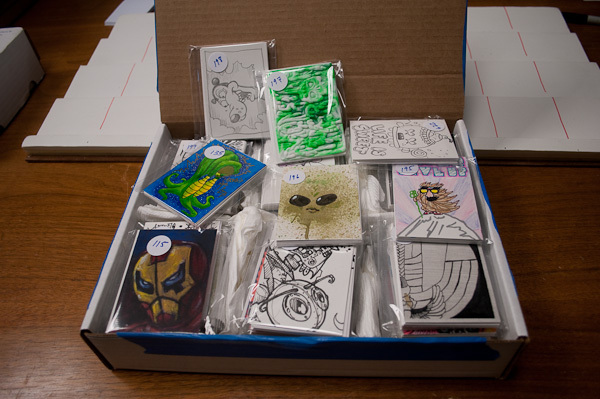 Each box gets 10 signature cards, and 2 original art cards. Cardhacks sends us numbered packets, with the allocated sets for the numbered box. Really cool to open them up, and see all the art cards. Many of the artists doodled on their signature cards, some even modifying them with cutouts and paint. Love the Godbeast art cards. Jesse Moore and Jason Atomic cards are always in my favorites list. July 21, 2010 - no comments. Posted by Larz in Suckpax 1. 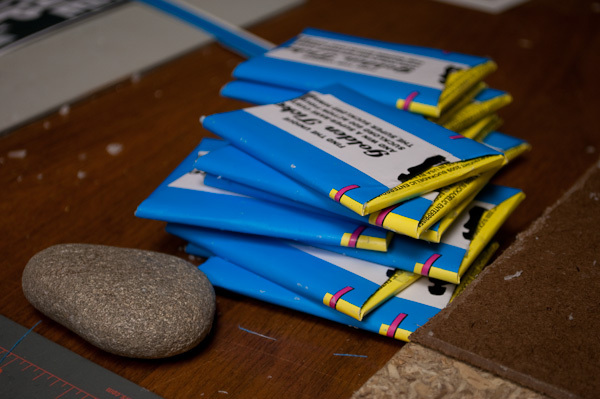 All of the wax packs are hand folded. 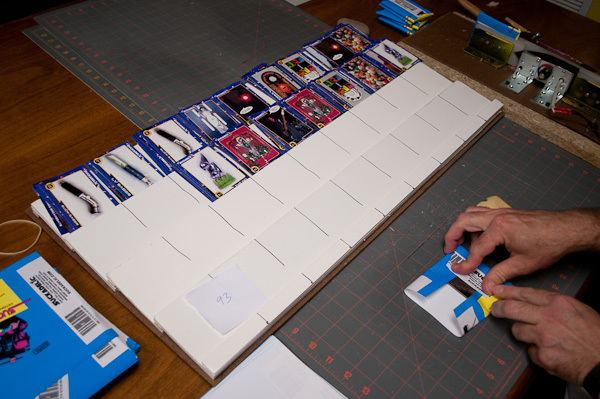 A board holding the 36 stacks of 7 cards each are brought to the wrapping station, and crack trained personnel utilize the official folding method. This reproduces the set of creases and folds of the vintage (pre-1990) packs. 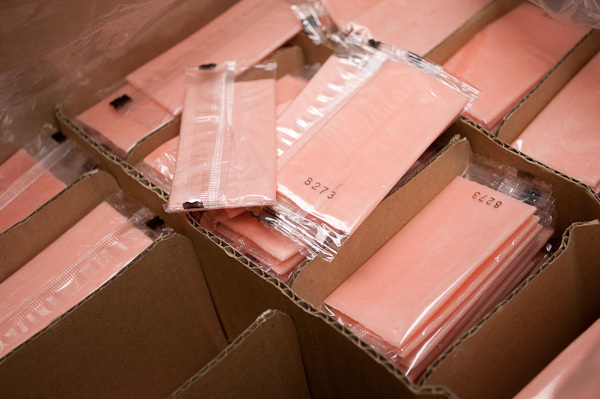 Before 1991, folded wax paper wrappers was the norm for trading cards. Around 1990 the first cellophane wrapped packs started appearing, and soon the foil end crimp packs. I have been on the hunt for an automatic folding machine, but have not found one yet. The closest I have come is Chicago 1996. I spoke with an executive with General Packaging, who said their last wrapping machine was broken up for scrap metal that year. The rock is heated, and used to seal packs? Zen contemplation object for mental health of folders? After the 36 packs are wrapped, they go into the box.